Learn from nine very successful people how to plan, develop, grow and market your personal brand. Donna interviewed successful South African people who have developed successful personal brands to find out how and why they are successful. 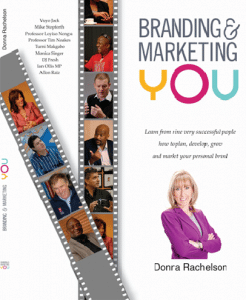 Donna explored their stories, vulnerabilities and successes for her book, Branding & Marketing YOU. Donna has read widely on the subject of personal branding and marketing and was struck by the fact that most books on the subject seem to be either mostly theoretical or, if there are case studies in the books, they feature only celebrity personalities. Each person profiled in the book is entrepreneurial and successful as a business professional and has become well-known and respected in their field of operation. Donna highlights how they use innovative and powerful ways to build and market their personal brands and are passionate and driven to make a difference inside and outside of their field of operation. Rachelson illustrates the importance of personal branding and marketing in today’s business environment and unpacks how brands evolve, identifying the components making up a ‘personal’ brand and highlights how to market it effectively. 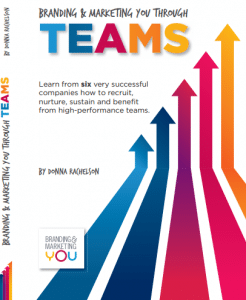 Branding & Marketing YOU through Teams is the 2013 successor to author Donna Rachelson’s best-selling Branding & Marketing YOU – first published in 2011 – which focused on personal brand development. This book garnered critical acclaim and is based on interviews conducted with teams at Microsoft, Sanlam, the MTN-Qhubeka cycling team, Gift of the Givers, Demographica and the Protea Hotels Group. The fascinating ‘conversations’ that result, provide fresh and valuable insights into what makes teams effective and how they contribute to brand development. The book is written in a very conversational, accessible style and will be of interest to anyone in business or private life with an interest in marketing, communications, branding or reputation management. This quick, practical read is a must for any woman who wants to make her mark in the business world. Women are occupying more senior positions in the world of work than ever before, but they still have a way to go. In many respects, the workplace is still a ‘man’s world’, run according to ‘men’s rules’. 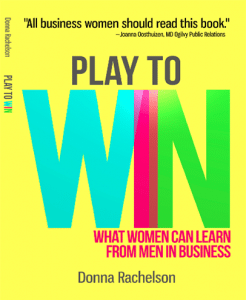 Donna Rachelson gets to grips with these rules and shows women how to work with them to advance their careers, while still retaining their femininity and bringing all of the strengths women possess to the workplace. Drawing on Rachelson’s own experience, as well as the experience of some of South Africa’s top businesswomen, this quick, practical read is a must for any woman who wants to make her mark in the business world.